Peacock Rug Care is your Area Rug Cleaning experts with over 30 years experience. A rug can hold up to six pounds of soil and dirt, therefore vacuuming on a regular basis may make the rug look good on the surface but the majority of the dirt is still embedded in the foundation. We use cutting-edge techniques with modern European equipment that gives you the most thorough cleaning available. All your rugs will receive a five-Star treatment at our rug spa. Watch a short video taken at our rug washing plant where you will see step by step how your rug will be cleaned! This can be found under Tips and How to Videos. When you choose Peacock Rug Care it’s like sending your rug to a spa! That’s because we utilize a unique European process and highly specialized equipment that delivers the very best cleaning results without abrasive scrubbing, harsh chemicals or power spraying, harsh chemicals or power spraying that can damage rugs. Our oriental rug cleaning system is the most gentle, most thorough rug cleaning system in Canada. It includes “dusting” with a system that gently removes abrasive sands, grit and dry soil to increase the longevity of your rugs. Submersion washing removes even pet accidents that have been absorbed by the rugs’ fibers. You’ll be absolutely amazed that the pet odours are completely gone. Non-destructive fringe whitening and grooming enhance the rug’s appearance. 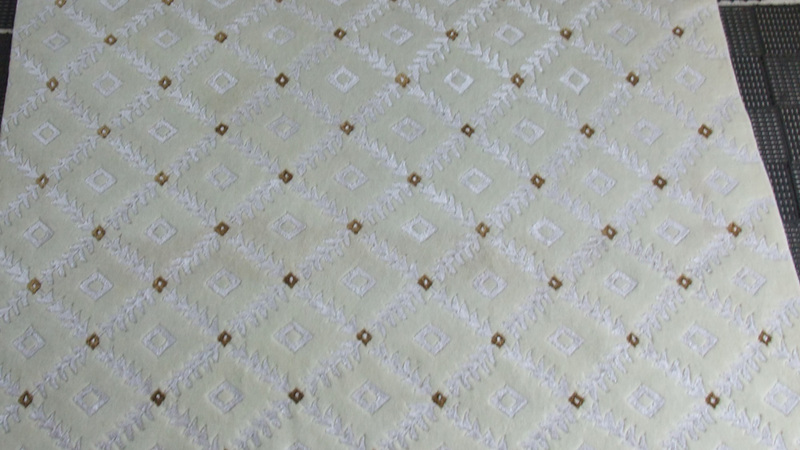 This method is safe for even the most delicate rugs and also works well on hooked and braided rugs. Contact your Ottawa Area Rug Cleaning specialists today for more information! We have special cleaning agents for pet accidents. You’ll love the results. Our process includes cleaning agents in the realm of nano technology. We utilize colloidal micelles for effective and safe soil removal. It is smaller than typical soap and detergent molecules. It seeks out and captures unwanted foreign particles that cause soil build-up and odor. The various blends contain extracts from plants such as cactus, coconuts, corn, grain, grass, potatoes, rice, soy, trees, and minute amounts of natural or nonionic surfactants and pure water. It is readily biodegradable (99.7 percent biodegradable in 28 days). Why a complete wash? We do this when possible for the same reason that people launder their clothes in a washing machine. Our aim is to get the best results! There are some exceptions, and therefore an inspection of the rug is necessary before a total wash is prescribed. 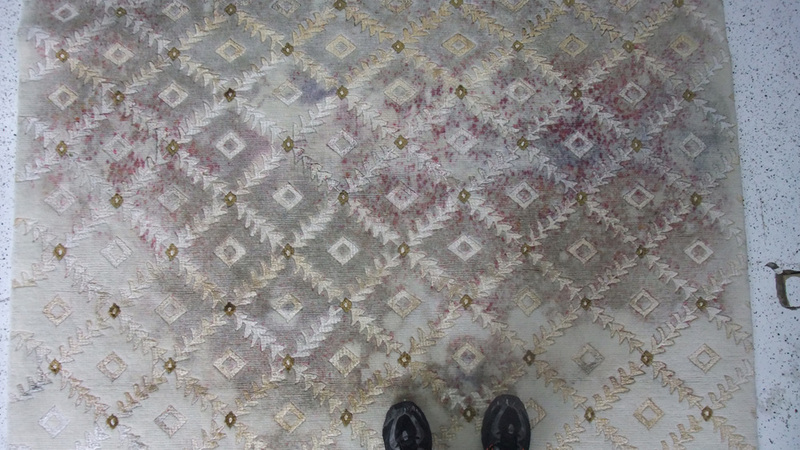 Each individual rug is unique, and therefore dictates how it is to be cleaned. When your rug arrives at our facility, it is carefully inspected for spots and stains, mildew, moth damage, soil conditions, wear, or concerns such as pet odours, etc. We then measure your rug and determine a cost for service and the best method of cleaning. The next step in your spa treatment is a “tumble dusted” to remove dry soils. Dry soil removal is critically important to restoring the appearance and maintaining the life of your rug. Although regular vacuuming can remove some of the particulates close to the surface, a vacuum is not powerful enough to remove dirt that is deeply embedded in the foundation of the rug. Those deeply embedded dry soils are abrasive that saw away at your rug fibers like sandpaper every time you walk across your rug! 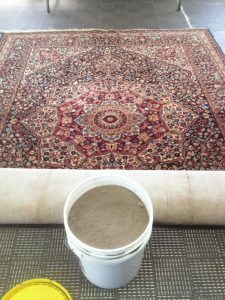 How We Remove Dry Soil: At Peacock Rug Care, we remove the dry soil from deep in the foundation of your rug with a proprietary soil separator that shakes loose all the dry particulate soil that has accumulated in the rug – even crusty soils that have been embedded for years! There’s simply no comparison to conventional rug beating. Pounds of dry soils are safely removed from the back of the rug without any risk of damage to the rug, fibers or fringe! The spa treatment continues as your rug is placed into our unique Turkish bath. This tub uses a special, velocity appropriate star paddle to provide gentle agitation that mimics age old hand washing techniques. Like today’s new energy efficient washers, the effectiveness of our equipment is based on the principles of gentle tumbling, dwell time and fast spin cycles that produce thorough washing of the entire rug structure with less moisture going into the dryer. An added bonus is that less cleaning agents are required, resulting in easier rinsing, soft fiber and brilliant colors. As your rug swims in the churning water, soils are removed and the appearance of your rug is renewed without the use of brushes, power spraying, scrubbing or other mechanical agitation that can damage rug fibers. Proprietary cleaning agents are added to aid in the cleaning process, and to insure that colors are restored to their very best appearance and that dye stability or dye transfer is never a problem. This system is so safe that we can clean even priceless heirlooms and sensitive foundation antiques with complete confidence! 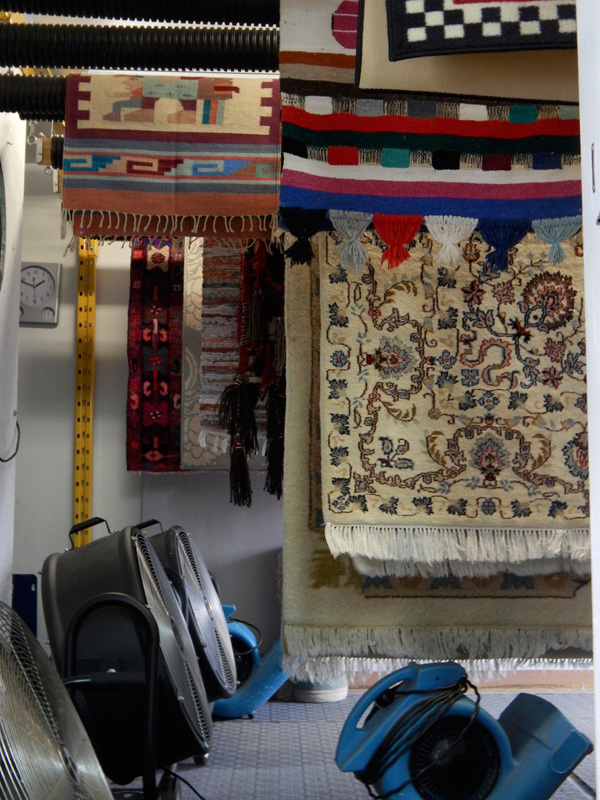 Once your rug is clean, we utilize a rug-wringing centrifuge that is designed to quickly extract water from your rug in order to accelerate the drying process and is protected from any pile distortion. When your slightly damp rug comes out of the centrifuge it is hung on special flat racks or hanging poles to complete the drying phase. Air is gently circulated to further speed the evaporation process. 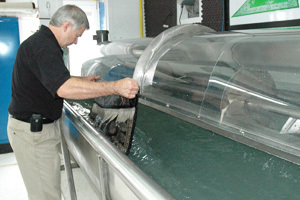 Mechanical vacuum extraction techniques used by many companies can only provide a form of top cleaning. Mechanical vacuuming extraction may distort pile and leave the rug wet for long periods of time. The drip-dry method is unsatisfactory and usually leaves the rug stiff. In contrast, centrifugal drying, results in the rug feeling and looking much better than if it had been cleaned with other standard methods. Once dry, your rug will undergo a final detailed inspection prior to being rolled for final delivery. Most carpet cleaning companies use a topical hot water extraction method of a bonnet method utilizing a dry foam or carbonated chemical. These methods absolutely cannot clean the foundation of the rug where oils, sand and animal fluids lurk. Those methods are just inadequate for complete cleaning. After we are done with your rug, it’s as clean as a tablecloth. Contact your Ottawa area rug & carpet cleaning specialists today for your free quote!